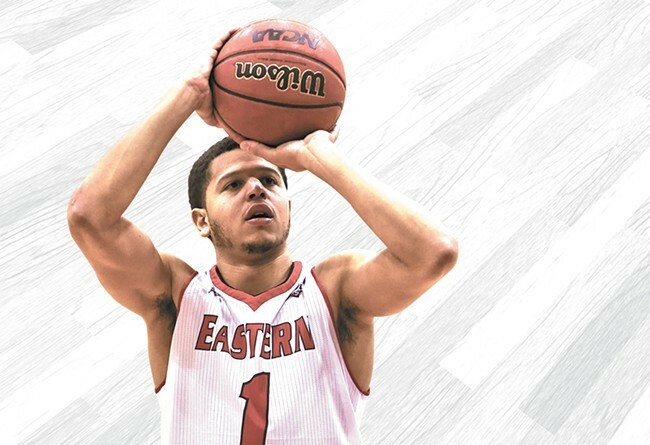 Tyler Harvey, who has progressed from walk-on to national scoring leader at Eastern Washington, will explore his NBA options before deciding whether to return for his senior season with the Eagles. Eastern coach Jim Hayford told the Inlander on Wednesday afternoon that Harvey will seek an evaluation of his draft status from the NBA next month before making a decision. “His plans at this time are to return to Eastern,” Hayford said. Harvey’s decision could be complicated if Hayford does not return. Hayford may draw interest from other schools after guiding the Eagles to a 26-9 season, regular-season (shared) and tournament titles in the Big Sky Conference and the second NCAA tournament appearance in school history. Chad Ford, the NBA draft expert of ESPN, lists Harvey as the 41st-best prospect for this year’s draft. The draft involves 30 players in each of the two rounds. Only first-round picks are automatically guaranteed money, but second-round picks can negotiate for guaranteed money. Graduating early also would permit Harvey to transfer to another Division I school without sitting out a year, which the NCAA requires of most transfers between Division I schools. Harvey, an Academic All-American, told the Inlander last week that he is not interested in transferring. Hayford was the only coach who recruited Harvey out of high school. The two were headed to NCAA Division III Whitworth in Spokane before Hayford left the Pirates to take the Eastern job four years ago. Hayford agreed to give Harvey a scholarship at Eastern after he paid his own way the first year while redshirting to add strength and weight to his once-skinny body. Harvey is now listed at 6 feet, 4 inches and 185 pounds. The Torrance, Calif., native leads NCAA Division I with 23.1 points and 4.0 3-point field goals per game and ranks 14th in 3-point shooting percentage at 43.1. The only NBA player produced by Eastern was guard Rodney Stuckey, who starred at Kentwood High School in Kent. Stuckey averaged 24.6 points as a redshirt sophomore at Eastern in 2006-07, then was drafted 15th overall by Detroit. Now with Indiana, Stuckey has averaged 13.4 points in eight NBA seasons.